Allison Brock and Rosevelt. Photos: ©SusanJStickle. 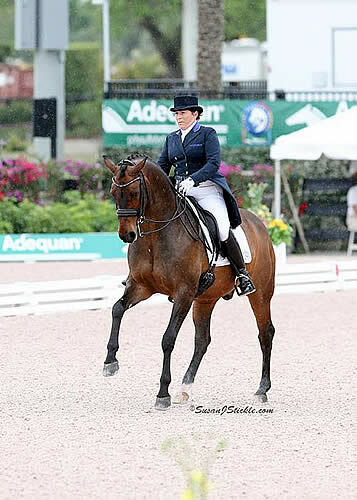 Wellington, FL – March 19, 2016 – Allison Brock (USA) and Rosevelt put on an impressive show at the Adequan® Global Dressage Festival (AGDF) this week with a first place finish in the FEI Grand Prix Special CDI 4*, presented by Havensafe Farm, with a score of 74.225%. Competition at AGDF 10 concludes tomorrow with the final day of the Florida International Youth Dressage Championships alongside the FEI Intermediaire I Freestyle CDI 1*, presented by Mike & Roz Collins. Lara Griffith (GBR) and Rubin Al Asad collected second place honors, receiving a 71.059%, while Lisa Wilcox (USA) and Galant earned third place with a 69.510%. 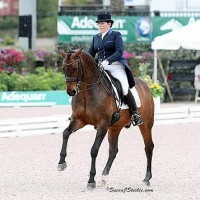 Brock discussed her time away from competition with Rosevelt, owned by Fritz & Claudine Kundrun, to concentrate on asking for more expression but not compromising the accuracy of their tests. Today, Brock executed a nearly flawless test, which earned them a 74.225%, tying their personal best score in the FEI Grand Prix Special, which they also achieved at the Achleiten CDI 4* last year in Europe. 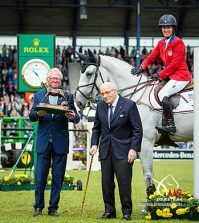 Watch Allison Brock and Rosevelt win the FEI Grand Prix Special CDI 3* here! The weather at AGDF today saw plenty of sun, but also torrential downpours right in the middle of the FEI CDI 4* class, which caught all top three finishers at some point in their tests or warm-up. Brock is typically very cautious of the weather with Rosevelt in terms of their preparation and warm-up, but the 2002 Hanoverian stallion handled the day’s adversity with ease. Lara Griffith and Rubin Al Asad, owned by Dr. & Mrs. Bechtolsheimer, have worked for most of the winter circuit on maintaining consistency at the Grand Prix level, which they’ve only been riding for two years together. 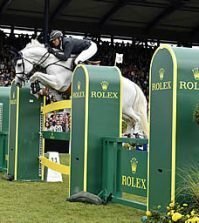 A bit dissatisfied with the pair’s test in the FEI Grand Prix, Griffith felt that “Rufus” was much more in front of her leg today, which earned them a significantly higher mark. “We’re lucky enough to have an indoor at home, so we typically get to stay away from the rain, but he handled it quite well and by the end of our test there was sunshine. That’s part of our sport though, so we managed it okay I thought,” she continued. Wilcox and Galant have just moved to the Grand Prix level this year after a successful Small Tour campaign at AGDF last season, and they are continuing to gain experience and knowledge at the higher level together. Wilcox, a veteran rider for Team USA, continues to test the massive Belgian Warmblood gelding in the ring, and their expression is starting to earn them strong marks, especially in their trot work. Galant, owned by Jacqueline Shear, has a true talent for the Large Tour movements. Wilcox finds herself always gauging Galant’s comfort zone during their tests so she has a strong understanding of where she can begin to push for more expression. Victory in the FEI Grand Prix Special for the CDI 3*, presented by The Dutta Corporation, went to Shelly Francis (USA) and Doktor, owned by Patricia Stempel, with a score of 70.569%. Canada’s Megan Lane and her own Caravella finished in second with a 69.627%, while Kasey Perry-Glass (USA) and Trostruplund’s Scarlet took home third place with a 69.078%. The Grand Prix Special is technically the most challenging test of the Large Tour classes, featuring the only walk to piaffe transition in the big tour, twenty-four one tempi changes divided between two lines, and very demanding piaffe-passage sequences. “I felt like this ride was a bit better, and I was sitting there able to determine what needed to be different, which is more difficult when I have a migraine. We just need to continue on with our practice,” she noted. In the final week of AGDF competition, Francis will make an appearance for Team USA on the Stillpoint Farm FEI Nations’ Cup CDIO 3*, alongside teammates Perry-Glass on Goerklintgaards Dublet, Laura Graves and Verdades, as well as Arlene “Tuny” Page and Woodstock. Francis indicated that she has been working all season to help make Doktor more steady and consistent, even when he is more sensitive and hotter to her aids. Lane and Caravella have been top competitors for Canada over the course of this season, and Lane was eager to improve on the constructive comments she has received from the international judging panels so far this circuit. Perry-Glass, coming off of a spectacular evening aboard her other Grand Prix mount Goerklintgaards Dublet in last night’s FEI Grand Prix Freestyle CDI 4*, presented by Havensafe Farm, found herself in the top three again today with Trostruplund’s Scarlet owned by Dianne Perry. 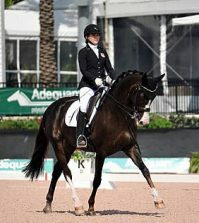 The pair has an established relationship together, and Perry-Glass felt their test today was an improvement to their Grand Prix test this past Thursday. Competition at AGDF 10 concludes tomorrow with the Florida International Youth Dressage Championships along with the FEI Intermediaire I Freestyle CDI 1*, presented by Mike & Roz Collins. 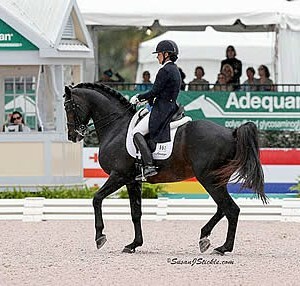 For more information on AGDF, please visit www.globaldressagefestival.com. The Adequan Global Dressage Festival (AGDF) is one of the world’s largest international and national dressage circuits featuring 7 FEI Dressage events, including a 5* and the only FEI Nations’ Cup Series CDIO in the Western Hemisphere. The AGDF offers more than $650,000 in prize money for the seven international competitions, making it one of the richest circuits in the world. The Stadium at Palm Beach International Equestrian Center facility includes the Van Kampen covered arena (made possible by Kimberly and Frederic Boyer and family) and four outdoor arenas with world-class footing, 200 permanent stalls, and a VIP seating area. or call 561-793-5867 for more information. 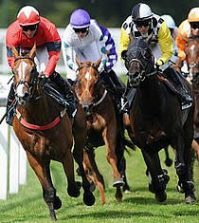 What Are the Main Betting Terms in Horse Racing You Need to Know?